I never really understood the purpose of chili since I don't like spicy food or cooked green peppers (and used to detest hamburger meat when I only ate the cheap stuff.) But as we've been increasing the protein content of our diets and decreasing the carbohydrates, I discovered that there are chilis that push my cooked tomato buttons without being full of empty carbohydrates. Plus, if you make it yourself, you can keep the spiciness mild, leave out the green peppers, and use pastured meat. This recipe serves 5. Meanwhile, sautee the lamb in a skillet until it's about halfway cooked (adding stock as necessary to keep the meat from sticking to the pan.) Cut up the onions and garlic and add them to the meat, continuing to cook over medium heat until the onions are soft. Add in the chili powder, thyme, salt, and pepper and sautee just a bit more, then pour everything from the skillet into your pot of stock. Throw in the spaghetti sauce or tomatoes. (I only used spaghetti sauce because our freeezer is nearly bare of tomato products. As I mentioned above, you could instead use about eight cups of stewed tomatoes and add a bit more garlic and onion to the previous step. I'm not sure if we could taste the basil.) Cook over low heat for about an hour until the flavors meld together, or for two hours if you started with stewed tomatoes and need them to lose some liquid. The USDA's nutritional guidelines gives this chili a B+, probably because they don't like all of the fat and cholesterol in the chicken stock and lamb. 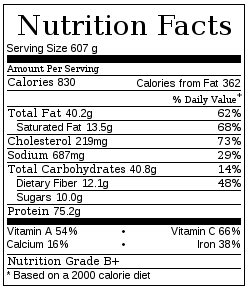 However, we're believers in the nutritional goodness of fats from pastured animals, so I'd give it an A. 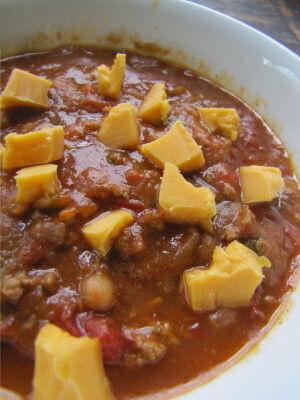 Of course, the meal needs some greens on the side to round it off, and cheddar on top of the chili makes it a treat. Sick of messing with poopy water every day? Our chicken waterer is the answer. That looks like a right nice recipie. I hope I get some sometime. We've just used up our last ground lamb, but you can always make it for yourself with any good ground meat you have on hand! 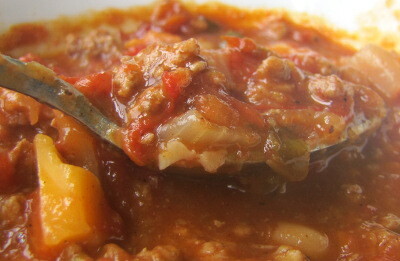 Oh, I'm glad you've found a recipe that has helped you to discover just how yummy chili can be! I'm a homemade chili addict, personally, although I don't like spicy food either. But you can put just about anything that you want in it and have it turn out well. I've never made lamb chili, but I've used ground beef, ground chicken, ground turkey, sausages of various types, and just plain old beans (eaten with homemade tortilla chips to complete the protein in the beans). I'm also liable to throw loads of veggies in - depending on what I have in the garden and/or the freezer - including carrots, celery, parsnips, summer squash, winter squash (usually peeled, cubed and pre-cooked if I'm in a hurry), sweet potatoes (similarly prepared), various greens, green beans, corn, peas, etc. I put in the peppers too, but then I like cooked peppers. It's just such a versatile dish, it seems a shame that many people presume it's only for lovers of spicy foods (since most of what you come across in restaurants is inedible, it's so spicy) and give it a miss. I am a bit curious about cooking the beans in broth, as I've always just used plain water. I've often heard that cooking beans with salt can make it more difficult for the beans to properly soften. Is your broth unsalted? Does the fat content of the broth affect how the beans cook? Do the beans take on the flavor of the broth? I think I'll have to try it myself next time I make chili, just to see how it works! Thanks for the recipe! I make my own broth, so it's unsalted, and it doesn't seem to keep the beans from getting soft. (If anything, they got oversoft in the couple of hours I cooked them.) I tend to use homemade broth as the base for everything, to add a bit of flavor and also because bone broths are supposed to be very good for you (and I hate to waste any part of real meat.) I'm not sure it's enough flavor on its on to make plain beans interesting, but broth certainly does seem to add a bit of complexity to flavors of soups and such.